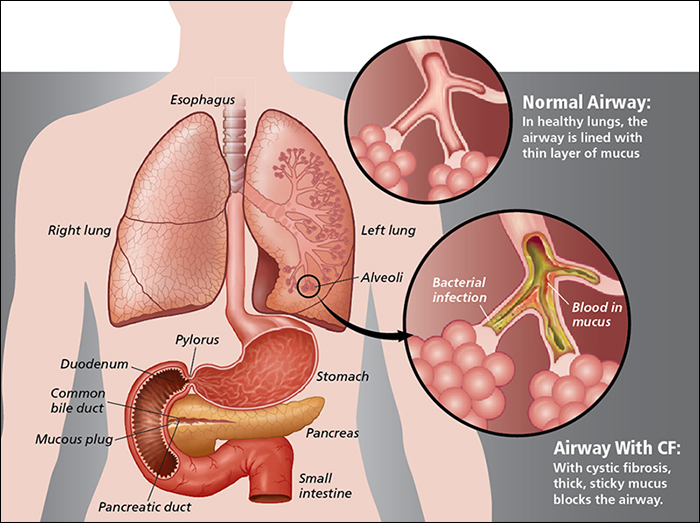 Cystic fibrosis is a progressive, genetic disorder which causes severe damage to the lungs, pancreas, intestines, liver, and other organs of the body. This disorder is caused by a defective gene; and it affects the cells which produce secreted fluids --- mucus, sweat and digestive juices. In people suffering from Cystic fibrosis, the salt in sweat increases and the secreted fluids (which are usually thin and slimy) become thick and sticky because of a mutation in the CF gene on chromosome 7. As a result, the secretions are no longer able to act as lubricants. Instead, they clog the tubes, ducts and passageways in the body, particularly in the lungs and pancreas. The clogging of the airways due to a thick and clammy build-up of mucus in the respiratory, digestive and reproductive systems can trigger potentially life-threatening health conditions in people affected by Cystic fibrosis. Hence, early diagnosis -- specifically newborn screening -- of Cystic fibrosis and its proper treatment are very crucial, for improving the quality of life of the sufferers and for increasing their lifespan. Some of the serious conditions which can be result of Cystic fibrosis include complications associated with the respiratory system, the digestive system, and the reproductive system. In men affected by Cystic fibrosis, the most prominent reproductive system-linked complication is infertility; and, in women affected by Cystic fibrosis, the chances of fertility are lower as compared to other women. The line of treatment for Cystic fibrosis is different for different patients, depending on their symptoms. While most of the elements of the treatment plans for the disorder are the same, they are personalized for the patients on the basis of their distinctive circumstances. This amazing herbal powder is prepared from a combination of several potent anti-allergy herbs which have proven properties to help patients suffering from asthma and other infections of the respiratory tract. This churna can manage chronic allergies and chronic bronchitis, treat common cough, break the clogged mucous, heal the inflamed respiratory tract, and control bleeding while coughing. The herbs from which Praanrakshak Churna is prepared are: Shirish (Albezzia lebbock), Dalchini (Cinnamomum zeylanica), Anantmool (Tylphora asthmatica), Vaasa (Adhatoda vasica), Mulethi (Glycyrrhiza glabra), Bharangi (Clerodandrum serratum), and Kantkari (Solanum xanthocarpum). Recommended Dosage: 1-2 teaspoons with plain water, three times a day, after meals. These capsules are prepared from the pure herbal extract of standardized Curcumin which is an active compound of the ‘Haridra’ (turmeric) herb (Curcuma longa). 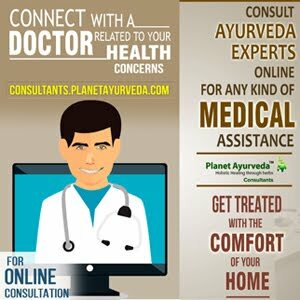 This herb and its Curcumin compound make the capsules an excellent herbal supplement which can effectively manage a number of health conditions. The use of Curcumin capsules can purify the blood, treat digestive disorders, protect the body against the damage caused by free radicals, manage inflammatory conditions, treat asthma and allergies, and reduce oxidative stress. Recommended Dosage: 1-2 capsules two times a day, with plain water after meals. The herbs used for preparing these capsules are widely known for their anti-allergic, anti-inflammatory, anti-diabetic, anti-cancer, antiseptic and analgesic properties. These capsules are very effective in maintain the respiratory health, improve the immune system, eliminate toxins from the body, maintain skin health, and balance the body’s Vata, Pitta and Kapha doshas. The herbal components of Aller-G Care capsules include: Haridra (Curcuma longa), Neem (Azadirachta indica), Ashwagandha (Withania somnifera), and Shirish (Albezzia lebbock). Recommended Dosage: 1-2 Capsules with plain water, two times a day, after meals. These capsules are prepared from a wonderful blend of some powerful herbs which can effectively manage complex problems linked to the digestive system. The herbal ingredients of these capsules can help the digestive process, maintain the natural pH balance in the stomach, stimulate the lever, promote proper assimilation of the nutrients in the body, strengthen the digestive system, and control acidity, gas, flatulence, and constipation. The herbs from which Digestion Support capsules are prepared include: Amla (Emblica officinalis), Haritaki (Terminalia chebula), Bahera (Terminalia bellerica), Sounf (Foeniculum vulgare), Dhania (Coriander sativum), Pippali (Piper longum), and Jeerak (Cuminum cyminum). Recommended Dosage: 1-2 Capsules with plain water, twice a day, after meals. For preparing these capsules, pure extract of some powerful herbs are used. These capsules are effective in maintaining healthy liver, supporting healthy digestive system, strengthening the stomach, allowing unobstructed flow of circulatory fluids, purifying the blood, lowering blood pressure, and removing toxins from the body. The herbs combined for preparing Liver Detox capsules include: Katutki (Picrorhiza kurroa), Punarnava (Boerhaavia diffusa), Kalmegh (Andrographis paniculata), Makoy (Solanum nigrum), Kasni (Cichorium intybus), Biranjasipha (Achillea millefolium), Jhavuka (Tamarix gallica), Himsra (Capparis spinosa), and Haritaki (Terminalia chebula). Recommended Dosage: 1-2 capsules twice a day, with plain water, after meals. These capsules are prepared from standardized extract of ‘Tulsi’ herb (Ocimum sanctum) which has proven medicinal properties. The herb is an immunity enhancer, and a natural immuno-modulator. Moreover, the herb is also abundant in beneficial bioavailable antioxidants, vitamins A and C, and calcium. Tulsi capsules can manage several health conditions, including Allergies, Cancers, Diabetes Skin allergies, Auto-immune disorders, Chronic Sinusitis and Chronic Rhinitis. These capsules can maintain a healthy digestive system, help the body to fight infections, and manage recurrent respiratory infections. Recommended Dosage: 1-2 capsules with plain water, twice daily, after meals. 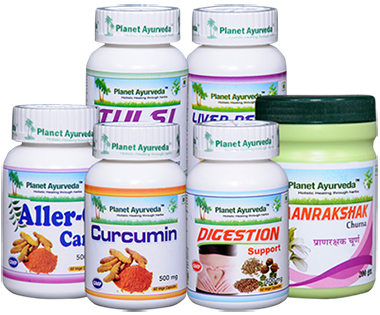 Planet Ayurveda's herbal formulations are completely safe to use. These formulations work in a synergistic manner to effectively manage the symptoms of Cystic fibrosis.